Tuesday, March 29, 2016: Kids Maximum Shelf: Thunder Boy Jr. Novelist and poet Sherman Alexie, who won a National Book Award for his semi-autobiographical YA debut, The Absolutely True Diary of a Part-Time Indian, makes his picture-book debut with Thunder Boy Jr., illustrated by Mexico-born Yuyi Morales, four-time Pura Belpré winner and the Caldecott Honor artist behind Viva Frida. 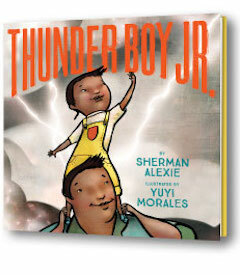 Alexie tells the playful and profound story of Thunder Boy Smith Jr., a Native American boy who adores the dad he's named for, but still wishes he could have his own name, and Morales takes Thunder Boy's dreamy, name-related musings and shoots them into the stratosphere with her electrifying illustrations. Thunder Boy Jr. not only wishes he could have a new name, he hates his name. Thunder Boy is his father's name, and the whole "Big Thunder" as Dad and "Little Thunder" as son distinction isn't working for him either. ("That nickname makes me sound like a burp or a fart," he says.) Why can't he be given a name, as is a generations-old Native American tradition, that celebrates something he's achieved on his own... something specific to him? Throughout the course of the narrative, he imagines all sorts of names that would be better than Thunder Boy. "I once climbed a mountain," he says, "so maybe my name should be TOUCH THE CLOUDS." Here, the "mountain" is illustrated as Thunder Boy's big strong dad, cradling his little sister, Lillian, covered by a blanket. On one spread, Thunder Boy says, "I once dreamed the/ sun and moon/ were my mom and dad,/ so maybe my name should be..." and Lillian chimes in "STAR BOY" in a cartoon bubble. In Morales's hands, the "STAR BOY" spread is a positively psychedelic explosion of stars, sun rays, textures and shapes in yellows, pinks, blues, browns and oranges, with Dad playing his guitar with twigs in his hat, Mom on her vintage motorcycle, Lillian leaping and Thunder Boy hurtling through space. 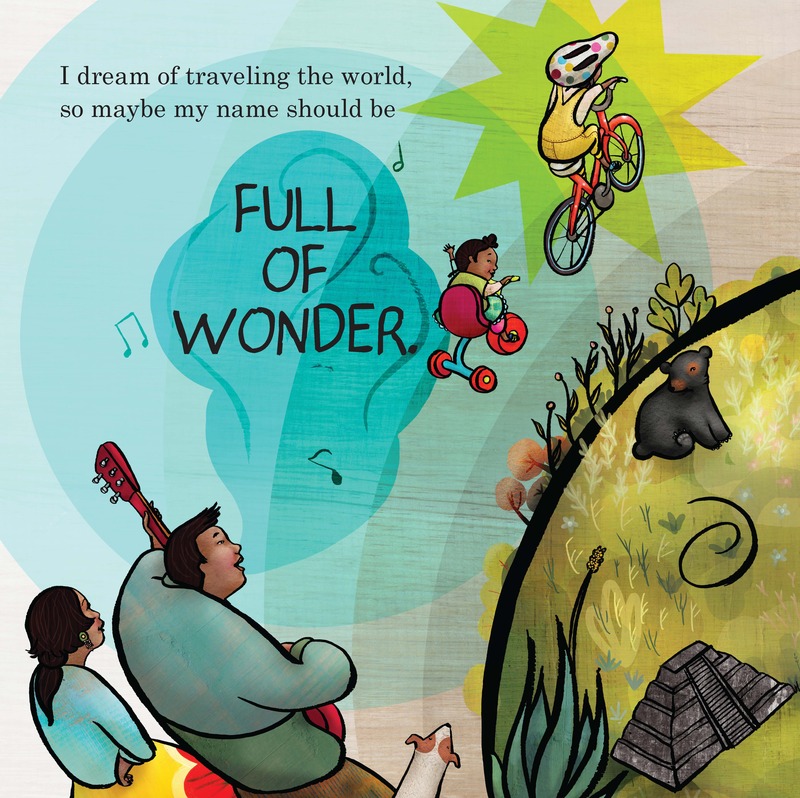 Later, he says, "I dream of traveling the world, so maybe my name should be FULL OF WONDER." Thunder Boy's proposed names are not all so lofty. 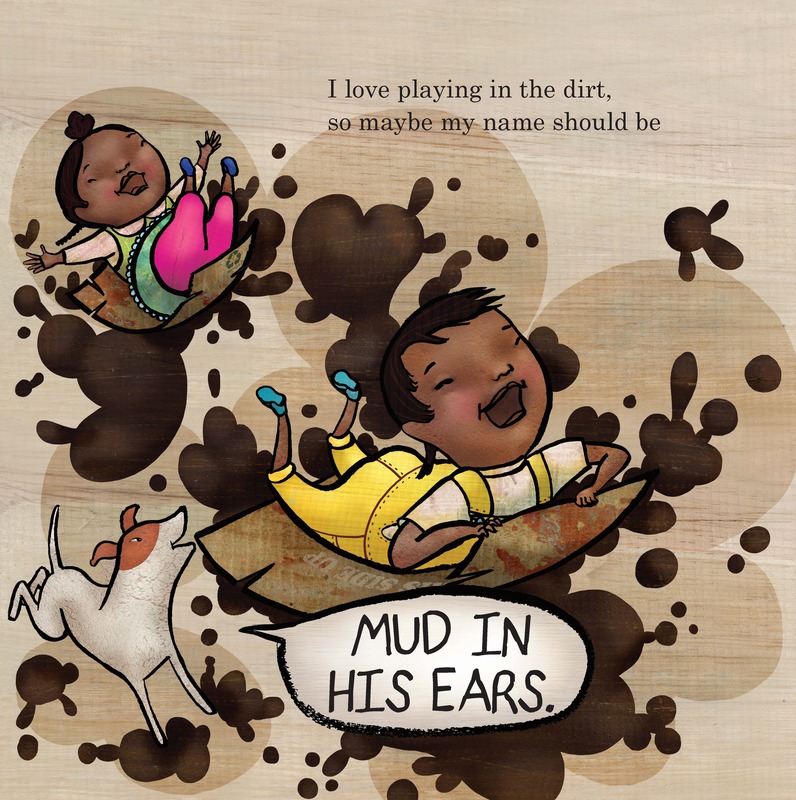 He would even prefer the name "MUD IN HIS EARS" (because he loves playing in the dirt) or "GRAVITY'S BEST FRIEND" (because he used to fall off his bike when he was three years old). Before Thunder Boy can work up the courage to tell his father how he feels about his name, Big Thunder picks up his son, who is shown sitting atop a green Earth, and says, "Son, I think it's time I gave you a new name. A name of your own." 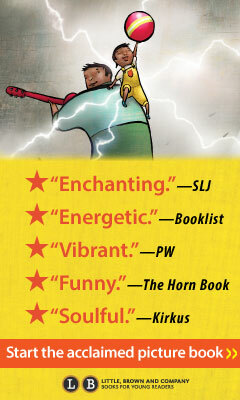 Readers will have a tough time not tearing up when Little Thunder thinks, "My dad read my mind! My dad read my heart!" Dad gives him the name "LIGHTNING." His son will be the lightning to his thunder. The boy thinks, "Together, my dad and I will become amazing weather./ Our love will be loud/ and it will be bright./ My dad and I will light up the sky." Morales exalts Thunder Boy's existential quest for identity with her exuberant dreamscapes, mighty thundering skies and green globes--all awash in vivid, saturated colors and textures that were lifted from old bricks and paint-peeling wood from her ancient house in Xalapa, Mexico. Except for Big Thunder, who sticks to earth tones, the family is adorned in bright, whimsical clothing: Agnes the mom's yellow, flowered skirt, which she wears with jeans underneath (presumably so she can hop on her motorcycle at any moment), Lillian's green tasseled skirt, which she wears with pink bloomers and her father's shoes, and Thunder Boy's yellow overalls, with the red center pocket. Circles are an essential design element in this crackling-with-energy picture book, from the interlocking orbs on the gorgeous, wood-grained endpapers to the red-and-yellow beach ball that gets tossed among family members from page to page. The circles tie the family together, and they also connect the family to the natural world. When Thunder Boy is thinking "I HATE MY NAME!" a coyote, a rattlesnake and a bear howl and hiss and growl in colorful circles above his head. Those same three animals appear later, playing drums in a powwow, and then roaming free on the face of the big grassy green Earth in the "FULL OF WONDER" spread. Sherman Alexie: What's in a Name? 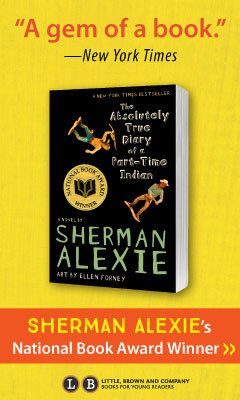 Sherman Alexie is a poet, short story writer, novelist, filmmaker, performer, and winner of the National Book Award for Young People's Literature for The Absolutely True Diary of a Part-Time Indian. A Spokane/Coeur d'Alene Indian, Alexie grew up in Wellpinit, Wash., on the Spokane Indian Reservation and now lives in Seattle with his family. 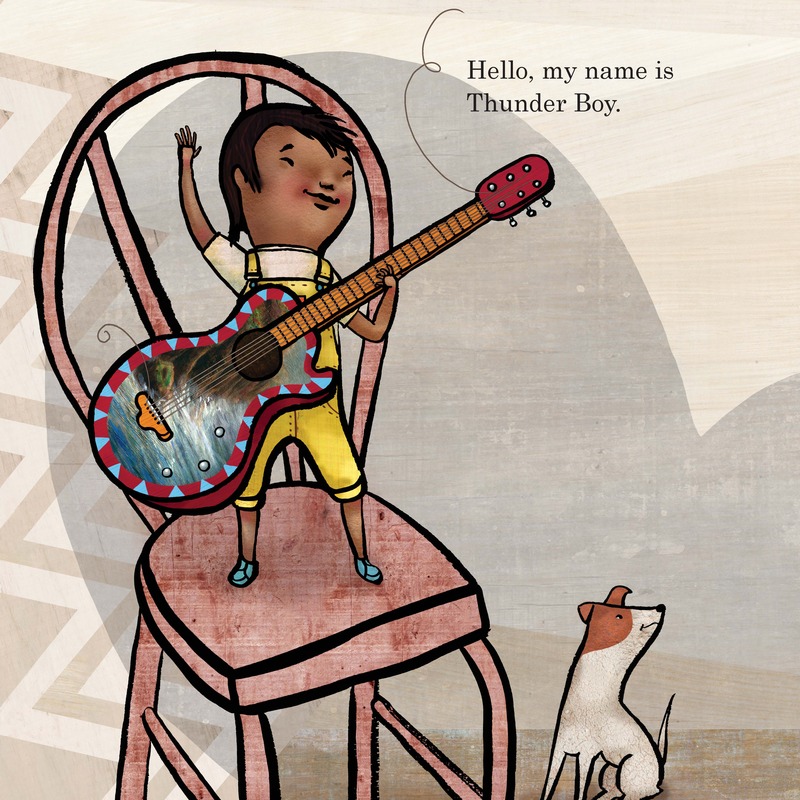 Here, he talks with Shelf Awareness about personal identity, carnivorous spirit animals and his debut picture book, Thunder Boy Jr. (Little, Brown, May 10, 2016), illustrated by Yuyi Morales. So, my most pressing question is: Have you ever in your life worn yellow overalls like the ones Thunder Boy wears? Oh my gosh! You know, we grew up on the rez poor. We weren't exactly an OshKosh B'Gosh family. So, if I did wear overalls, I'm pretty positive they would have been Wrangler, in a standard blue. Identity is a major theme for you personally--it makes sense that your first picture book would be about identity, too. But it's not a kid insecure about his Native identity. It's a kid insecure about his existential meaning in the world. It's also about your self-definition, and that's the most important thing. A tribal identity is one thing. It's beautiful, or it can be beautiful. But personal identity is so eccentric. True Diary is about a painful dysfunctional march toward identity, Thunder Boy is about a loving, beautiful journey toward that same thing. I don't think we often think in the popular culture or the literary culture about the Native American quest for identity being beautiful. Where did the idea for Thunder Boy Jr. come from? Two origins really. I was at my father's funeral in 2003 and they lowered the casket and I looked at the tombstone and it said "Sherman Alexie." I'm Sherman Alexie Jr. So, I thought, oh my god, the weight of being a "junior" at that moment was intense. I knew I'd have to write about it in some way. And then the other thing is that it was a family game we played our entire lives, of giving each other Indian names, based on the moment. Sometimes loving, sometimes teasing. And I've continued that tradition with my kids. So, it's a way of playing around in an everyday fashion with an ancient tradition. It's an adulthood ceremony. A kid would get a new name based on something they'd accomplished. For instance, Crazy Horse's first name was Curly. And then at some point, because of various accomplishments, he became Crazy Horse. Curly. It sounds funny because of the cultural context of the Three Stooges, but the Three Stooges didn't exist when they called Crazy Horse Curly. I guess the movie Dances with Wolves went a long way to broadcast this tradition? Yeah, it did. In good and bad ways. Understanding and empathy for Native American culture, yes, but also lots of appropriation of white people giving themselves Indian names. Lots of vegetarian white people giving themselves the names of carnivorous spirit animals. Nothing's funnier than a vegan telling me their spirit animal is something carnivorous like an eagle. Well, one of things that happens in the Native world is that there's still this desire to give your kids really ornate names, really poetic names. If you don't call your kid Crazy Horse, you're going to call your kid something fancy, in the contemporary idiom. I've got a cousin named Aristotle, my dad's dad's name was Adolf and his dad's name was Alphonse. Junior. My father also had a nickname for me based on a Western character... a character named Regret. Did that not doom me to a life of writing? This is Regret, and here's my sister Ennui. Did you have a close relationship with your father like the boy in the book? No. Not nearly as beautiful. That was also part of the book, to represent that overtly tender, overtly loving relationship. I never doubted my father's love, but he was a mess. To show a non-mess Native father and non-mess Native mother as a family unit was important to me. How did it go for you, writing a picture book? Well, because I'm a poet, I thought it would be easier. I'm used to writing things that have 50 words and have to carry the meaning of the world in them. But that wasn't the case here. It wasn't even like poetry for kids, which I've also done. There's this magic point where the book becomes 70% for the kid and 30% for the adult who reads the book to the kid. And you have to find that percentage, and it took a long time. The artwork in Thunder Boy Jr. could not be more exuberant. Did you collaborate with the illustrator, Yuyi Morales? No, she read the book and went for it, so that's her. In some ways I feel like I was the screenwriter and she was the cinematographer. One of the reasons I picked her, among many, was that she's a she. And she's a mother. 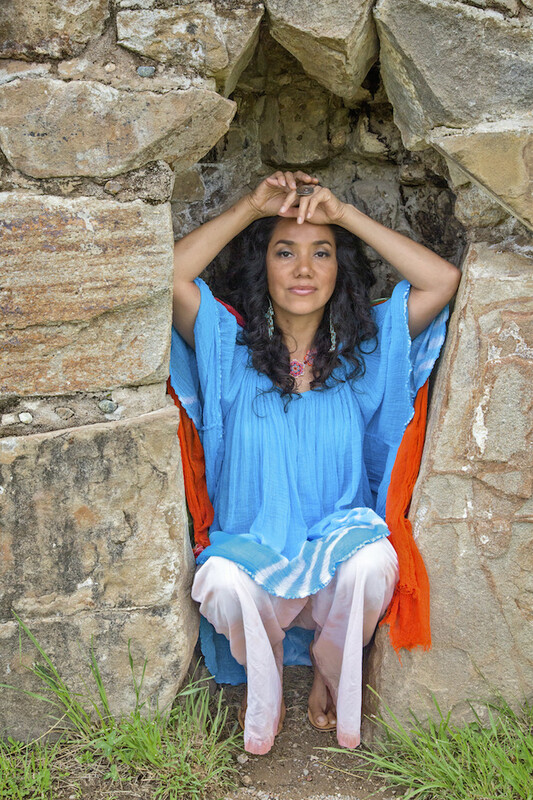 And, because she's Mexican and is very familiar with indigenous culture. And also, she's a minority in the United States. So I think her artistic ambitions and mine, politically speaking, matched up well. So when I first saw the drawings I thought, "Ahhhh, yes, yes, yes." What I had imagined was this Salish kid from Washington State. From Seattle. I imagined him as a contemporary, indigenous person, which means his cultural influences are vast... from different places. Thunder Boy has a very specific personal identity, but the artwork has influences from many parts of the country, from Mexico's and Central and South America's indigenous imagery. We wanted to speak to a wide variety of people inside of indigenous communities. 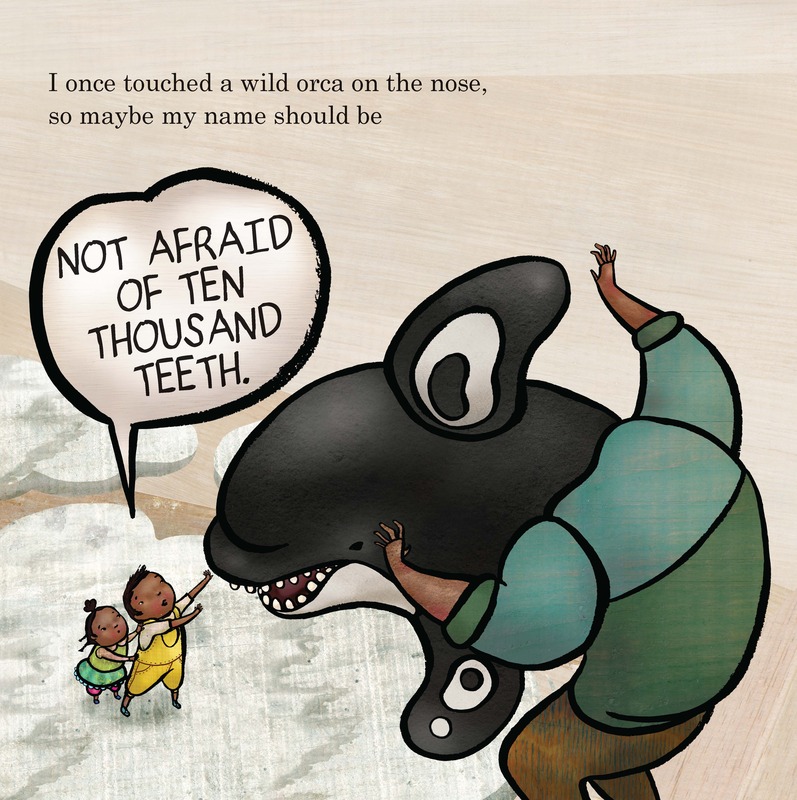 Thunder Boy says, "I once touched a wild orca on the nose, so maybe my name should be NOT AFRAID OF TEN THOUSAND TEETH." In that scene, Thunder Boy's dad is wearing an orca mask. Is that what you had in mind? I meant it as a metaphor, not real. I meant it as a kid dreaming. But Yuyi and I never talked about it. So, when I saw that as his father, oh, that made me cry. It's gorgeous and, no, that was her. That was one of the most beautiful things about this--Yuyi and I collaborated, but at a distance. And I completely trusted and respected her vision. Do you have more books for young people in the pipeline? Known for her fantastical images and exquisite use of bold color, Pura Belpré winner Yuyi Morales illustrated Niño Wrestles the World; Just a Minute: A Trickster Tale and Counting Book; Los Gatos Black on Halloween; Just in Case; and Viva Frida, which also won a Caldecott Honor. She talked with Shelf Awareness via Skype from her home in Mexico about illustrating Thunder Boy Jr. (Little, Brown, May 10, 2016), written by Sherman Alexie. It seems like you and Sherman Alexie have similar values--as parents, storytellers and people who straddle two cultures. Does it strike you that way, too? 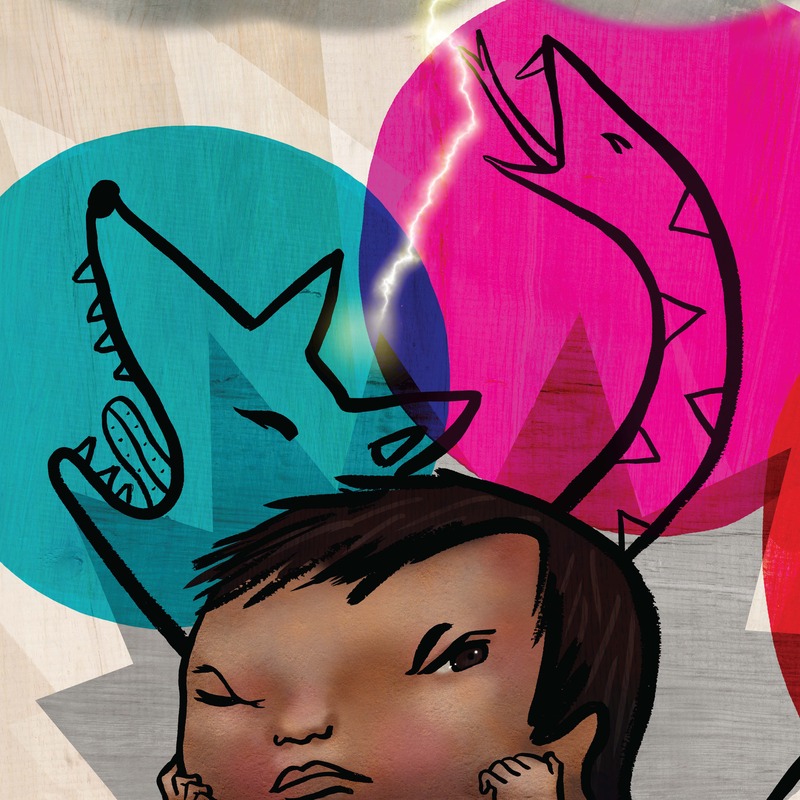 Thunder Boy is an opening into the way Sherman's culture works. But it connects to things that are a part of my culture as well. I do feel like we have a very similar interest in heritage, where we come from, and also where we are going. With all your imagery of the Earth, of thunder and lightning, and dreamscapes, you took Thunder Boy Jr. to a whole different level. In your hands, Thunder Boy's existential wrestling with his own name and identity becomes a question for the cosmos. Did you collaborate with Sherman? I never talked directly with him, but we worked in the traditional way, through the editor. I had questions about utilizing some images, since it's not my culture and I wanted to make sure I wasn't being stereotypical, out of ignorance. Learning about other cultures has been a process--just realizing how much I don't know. And at the same time, how much we all have in common. At one point Thunder Boy says, "I hate my name!" Tell us about the coyote and rattlesnake and bear that appear above his head. I wanted to make a connection with nature. But also with emotions. When you are feeling angry, part of you is released, and can be expressed as a coyote, or a snake hissing. I wanted to make this connection with nature and the nature that we carry inside ourselves. What do all the circles represent to you? They are the connections with the family, and also with the community, and with the world. It is from these connections that we build our identity. And the beach ball is just another circle, a way to pull them all together as they pass it from one to another? Exactly, and so are the circles of color on the endpapers--a representation of the interlacing of our experiences. Your illustrations are bold, colorful and alive. How did you create this artwork? I used my house! It's very old, and it's in the city where I was born. Xalapa is one of the first pre-Columbian communities. The house on the land I bought was in ruins. The wood had layers and layers of paint when I scraped it. Because of the weather and the time, it had these colorations, and I thought they would be perfect to create a palette. The bricks were the skin colors that I used, including the dog's. And the wood was everything else. I was able to manipulate the colors with my computer. Is there a story behind the yellow overalls? When my son was little, he wore overalls all the time. I also wanted Thunder Boy to be his own self. He's not afraid of those colors, and if I could have done it, I would have given him pink overalls because hot pink is one of my favorite colors! Sherman said it was your idea to interpret Thunder Boy's dream of touching an orca whale on the nose as the boy touching his father's orca mask. How did that idea come to you? I recognize that many children are struggling with their own image, and their own identity, against that of their own family and the adults in it. When they try to compare themselves with us, the adults, they think they are not good enough. In this case, I wanted to have Thunder Boy recognize that this big killer whale is also a playful whale... and his father. A challenge and a connection. Not something to fight against, but something to conquer. Children don't need to go and touch a real killer whale to think they have done a real heroic thing. The real challenges are right at home. Anything else you'd like to tell the readers of Shelf Awareness?